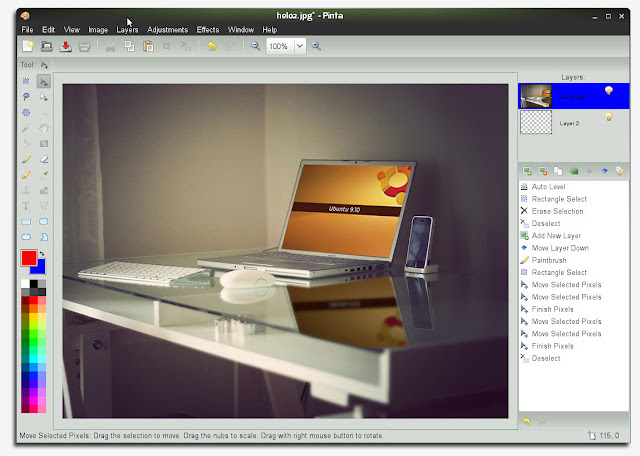 The open source image editing application GIMP is often refered to as huge and complex, being a high-end application for professionals. GIMP isn't the tool that you would advise every user to use for their casual photo editing. This is also the reason behind the decision to remove the GIMP from the default Ubuntu 10.04 installation. We've all heard this before, but now a new lightweight open source image editing application called Pinta aims to give casual users a simple alternative to the GIMP. Jonathan Pobst was inspired to start the Pinta project after reading an article on OSNews stating how something like Paint.NET was needed for the Linux desktop. Pinta is currently very early in development (version 0.1), but this might be a much wanted application for the Linux desktop and perhaps it might find it's way into future versions of Ubuntu. I'll give it a try, thanks. Im currently using Photoshop in Wine, and never quite grasped GIMP. Inkscape is pretty easy and I like it, but GIMP is a chore. I'll give this oen a try too. Whats up with the photo above? Ubuntu + iPhone? Working seamlessly together? Is it a joke?? GIMP is definitely not complex and not difficult to learn. Installing GIMP PAINT STUDIO will give artist a simpler and intuitive GUI. No Human Theme In Ubuntu 10.04?